The Export Data feature exports the text data in a diagram to Word, Excel or plain text format. If you want to export the data in the diagram format, please visit here. 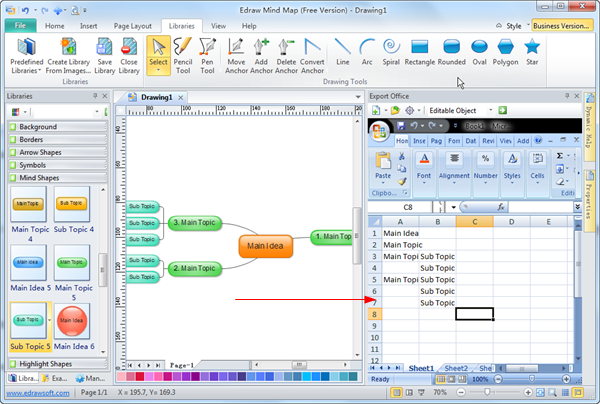 You can export Mind Map diagrams to an Office Word or Excel file to work with the data in a linear format. You can also export mind map diagram data to a plain text or cvs file that can be edited for use in other programs. The following image is a mind map created by the Edraw program. 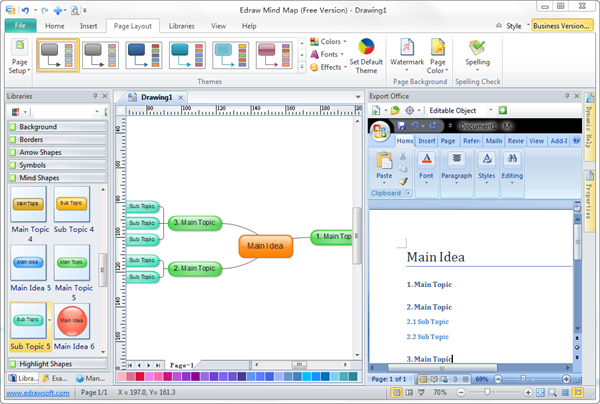 On the Mind Map menu, point to Export Data, and then click MS Word Format, To MS Excel Format, CVS Format or Text Format. The MS Word document window will be embedded into Edraw program and the data of the current diagram will be exported to a blank MS Word document automatically. To save the MS word document, you can click the Main button in the Microsoft Word window. Tips: To export mind map diagram data to Word or Excel, you must have Microsoft Office Word or Microsoft Office Excel installed. On the Mind Map menu, point to Export Data, and then click MS Excel Format. The MS Excel window will be embedded into Edraw program and the data of the current diagram will be exported to a blank MS Excel worksheet automatically. On the Mind Map menu, point to Export Data, and then click CVS Format or Text Format. In the File Save dialog box, for File name, type a name for the file.